As a data processor I just had to switch to TweetDeck. The built-in Twitscoop view is a constant finger on the pulse of the community’s conversation; I “see” a lot of news and events approaching this way before they hit the news. Another great feature is built-in persistent searches. You can add searches the Tweets of which will appear in their own column. A “drawback” — one is never satisfied — is that TweetDeck enforces a 10 column maximum. You’ll quickly run out of columns to add, having to delete a previous search to start to monitor a new topic. Searches in TweetDeck are powered by search.twitter.com (the previous Summize). 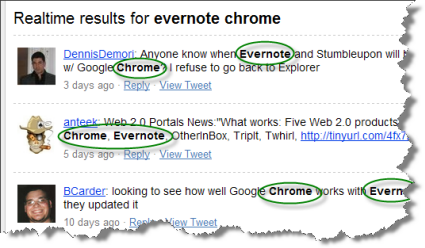 The default operator applied is AND: evernote chrome. 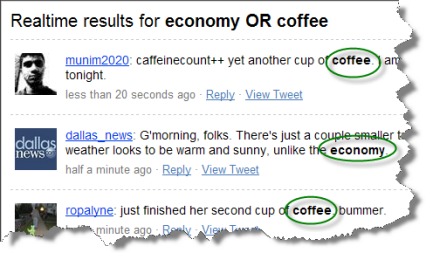 But Twitter search recognizes the OR operator: economy OR coffee. This gives you the ability to combine or collapse a number of searches into one and the same column, giving you “virtual unlimited columns” in TweetDeck. Good candidates are searches which during most 48 hour periods, the timeframe TweetDeck considers, produce limited results. For example, I combine the streams for knowledge management and mindmapping. Topics can be more thoroughly covered this way as well. Hot is The Economy at the moment but simply searching economy gives you a restricted view. economy OR recession OR “wall street” OR “credit crunch” is much wider, covers more ground. Top-right of each column is an X mark. Click it to delete the search. Oh, that’s a scroll bar along the bottom! DUH! TY Ruud, I can’t believe I didn’t figure that out. Hopefully it helps a ton of people. hi. how do i search within tweetdeck for posts near a zip code and within a certain mile range? like you can with advanced twitter search? TweetDeck uses Twitter’s own search: any search there can be set as a saved search in TweetDeck. So just copy whatever you put in the searchbox there and add it to TweetDeck. TweetDeck does not seem to work with the “near:” search command. I tried “near:78701″ and got blank results. Ruud.. thanks for the post. It seems that AND and OR work but other operators such as near or within will work in twitter search but don’t work in tweetdeck. Am I wrong? hiya, Ruud, how are you? I’ve been trying to do this & can’t get it to work when there is a ‘location’ in my twitter search. Speaking of combined searches in TweetDeck: I put in a search like: #hashtag OR @TwitterHandle. I want the search to get any tweets that have the Hashtag specified, OR Mention the @TwitterHandle OR are posted by the @TwitterHandle person. that last part seems to be the problem. what I want is a Combined search that shows posts mentioning a text string PLUS Follow everything from a specific user. Can you do that in Tweetdeck? this is a necessary upgrade! i wish i could combine feeds based across networks. for example, my ALL FRIENDS list from linkedin and twitter together would save me a column. multiple tabs for organization would also be awesome! I’ve had mixed results with the geocode location search operator. When I use the geocode I get a whole bunch from the other side of the world listed as “home sweet home”. From all my searching I cannot seem to figure out how “home sweet home” even gets put on the profile as a location.